Nearly 20,000 customers were left in the dark after two separate incidents caused power from Oshawa PUC to be knocked out. Areas in the dark spots on the map are where outages were reported. The failure in a piece of connective equipment is being blamed for a pair of power outages that left nearly 18,500 people without power on Monday evening. At around 6 p.m., wide sections of Oshawa’s north end turned black, causing traffic snarls and backups on most of the city’s main streets. 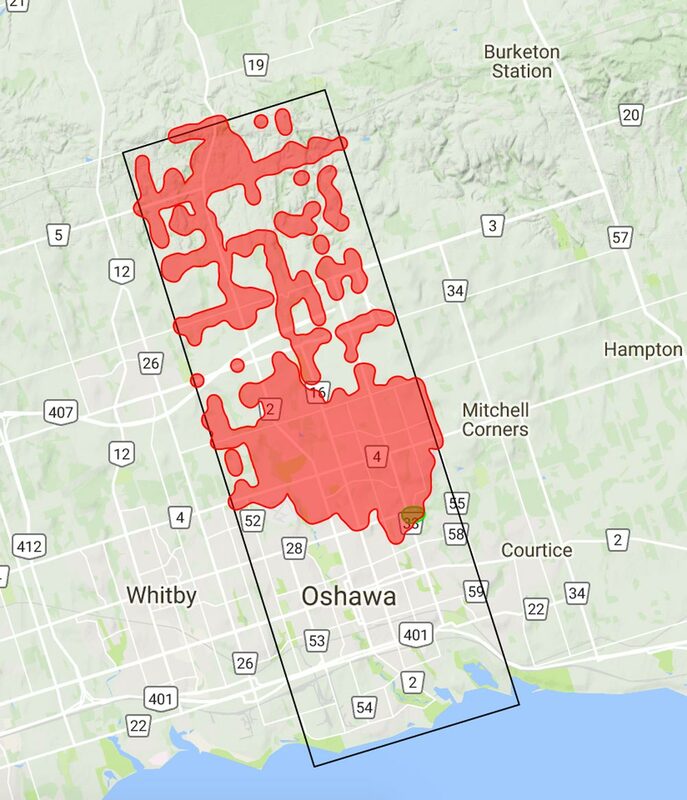 It was quickly announced on Twitter by the Oshawa PUC that 18,463 customers were without power in northeast Oshawa. The tweet also mentioned power would be repaired by approximately 8 p.m.
Ivanno Labricciosa, the OPUC’s CEO, says a connector piece known as a conductor splice holding together a 44,000-volt line gave way, causing the initial outage. However, just as the OPUC was repairing the problem, a switch blew due to the amount of abnormal activity on the grid, causing a second blackout. “We had multiple problems – we had that (splice) as the root cause, but then in our process to restore power, given the number of things we had going on the system, with repairs and maintenance we had the system in an abnormal state, we then had a switch failure that created a secondary problem,” he says. Affecting largely the same area, power began to be restored to some areas of the city by 10 p.m. with power being fully restored by 11:30 p.m.
“We’ve had one other like this and generally it’s not a complex repair. So what should have been maybe an hour or less in terms of repair time turned out to be five hours,” Labricciosa says. The blackout is the largest the OPUC has seen since the ice storm in 2014. Whether the failure of the original piece of equipment was due to a faulty installation or a defective part is still unknown as an investigation has yet to be completed. The outage also caused the closure of the UOIT and Durham College north campus after their back-up systems failed to function, Labricciosa says. The blackout taught the OPUC several lessons about communicating with its customers during an outage as hundreds of people took to Twitter to figure out what was going on. “It’s gotten better given our storm response and things that we’ve had in the ice storm, but we still know there’s improvements we can have there,” Labricciosa says of the OPUC’s response. The power failure is also a chance for the public to realize the importance of their back-up systems.